Reduce your energy costs with this energy efficient fixture. This decorative energy efficient flush dome fixture is as functional as it is decorative. Finished in brushed nickel this fixture is easy to coordinate with many of today's colour schemes. The heavy alabaster style glass is perfect for even distribution of light and glow. 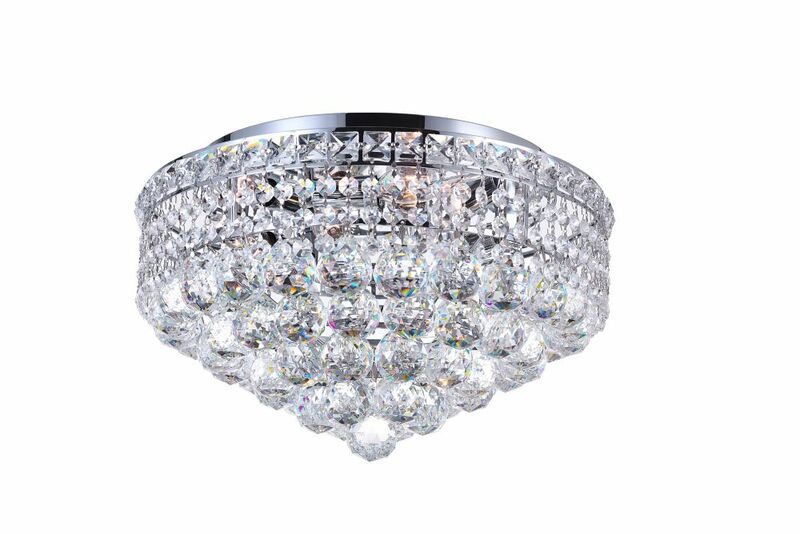 16-inch 4-Light Round Polished Chrome Flushmount Lighting Fixture is rated 3.0 out of 5 by 2. Rated 1 out of 5 by Sammy from When I opened the box I was missing 71 crystals and there was a crystal in the box that did not b... When I opened the box I was missing 71 crystals and there was a crystal in the box that did not belong to the light. The hardware did not appear to match the inventory list. The shipping box said "1 of 1" but there was another very small label on the box that said "2 boxes." I was only given one box. I returned the light to the store because I don't have time to play "find the missing pieces." I don't know if this was a manufacturer error or a store error. Rated 5 out of 5 by nanuko from my family and friends love it! my family and friends love it!